HST is the operative drug in this movie with a line of Deppster and a Gilliam chaser. And so Hunter S. Thompson's classic novel finally makes a splash (more like a flood) on the silver screen. Hold onto your seats and hold onto your heads. This is one trip to L.V. you're not liable to ever forget. Warning: Don't do anything before seeing this movie that might make you paranoid; unless that's what you're into. Director Terry Gilliam is on the loose again. The first message held up before our eyes reminds us that "He who makes a beast of himself gets rid of the pain of being a man. - Dr. Samuel Johnson, 1709-1784." It seems some things never change. So, in that case, let's move a couple of centuries forward: ZIP! 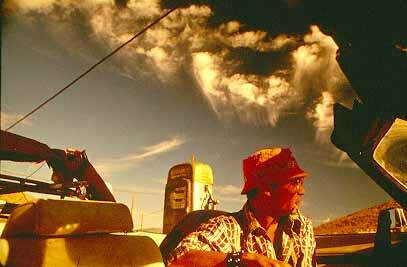 It's 1971 and journalist Raoul Duke (Johnny Depp) and his manager/attorney/friend Dr. Gonzo (Benicio Del Toro) are speeding down the road through the desert in their red convertible with a suitcase full of drugs and a state of mind which is almost as incredible as the world they live in. Exaggerated? Where were you when the lights went on? Now you're in Bat Country and on your way to Hell. Thompson actually took the journey that the novel is based upon with his friend and associate Oscar Zeta Acosta, lawyer and activist from Chicago. "As true Gonzo Journalism, this doesn't work at all (and even if it did, I couldn't possibly admit it. Only a goddamn lunatic would write a thing like this and claim it was true." Las Vegas of 1971 simply doesn't exist anymore. The new Disneyland-type city which has sprung up since then in the middle of the desert has evolved in accordance with a "fun for the whole family" ideal (?). In `71 it was closer to fantasy neon and rampant madness laced with a harsh reality. Then again, if you're Terry Gilliam why would you make things easy on yourself. Among the tasks necessary to establish certain historical locations were recreating the now missing Mint Hotel as well as previous incarnations of the Desert Inn and Flamingo Hotel. Added to these is the new design for the fantastic Bazooka Circus Hotel and Casino (certainly the place to stay if you're a freak) which is one spot nobody is likely to ever forget. Actual existing locations were also utilized, undoubtedly creating even further confusion for contemporary casinos and crowds. Go for it, Terry! Back to the Bazooko Circus, which production designer Alex McDowell explains is, "a casino that has a circus theme and the real inferno of the story. On one level it has to be attractive, as any fun fair would be, but there's seething ugliness beneath the surface." There's always something to do. Guests can choose among the various games on offer including an M16 Shooting Gallery where ducks wear Vietnamese hats, Shoot the Vital Organs which uses hypodermic like darts, or the simple toss game Knock the Kid's Teeth Out. The revolving carousel bar turns wildly as acrobats soar insanely overhead, flying each other as well as frightened wolverines. Perhaps the pain and need and isolation and hope are not as obvious as they might have been to drive points home about connection to the environment and society and, ultimately, influences upon a state of being, but the image of these two men adrift in a world of madness and paranoia is enough to suggest all of it. Nixon (who was Time magazine's "Man of the Year" in 1971) swims through the hotel room from a TV screen in the same timescape where protest marches about Vietnam are taking place while elsewhere (not so very far away) lounge lizards swill their drinks and Debbie Reynolds sings to enraptured audiences. Vegas has become another kind of world; one inside and reflecting the outer world. Is there any way outa' here? Wherever Thompson is busy turning the next page, Gilliam is busy to inducing the next stage. Designer McDowell explains that "Terry's instructions were to look to the book if the script wasn't providing enough information. We pored through Thompson's book and (Richard) Steadman's illustrations, an then came up with our own ideas based on the script and whatever we were able to bring to it." Johnny Depp, well on his way to establishing himself as THE most extraordinary American actor produced during this rapidly passing final quarter of the 20th century, creates yet another memorable role for his fans. Not a man to take his work lightly, he remarks that, "Fear and Loathing has been screaming to be made into a film since it was published 27 years ago. The book came out of the beginning of the death of the American Dream. But Hunter was still out there searching for it, searching madly, hoping that the Dream still existed, and all he found was madness in every direction, and tragedy and greed. This book represented a great quest for Hunter and a kind of exorcism at the same time. 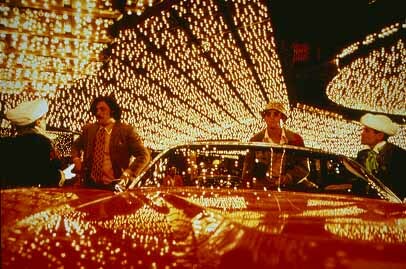 Fear and Loathing is about hope, it's about insanity, it's about trying to find something out there to believe in." Not only did Depp read everything written by Thompson that he could get his hands on, but he spent a number of months with him in order to study him for the role and during that time wound up becoming his road manager as well as a good friend. He admits that, "I wanted to make Hunter proud because his story deserved all attention and all focus. So I just tried to make myself look as much like him as possible. I shaved my head on top and just left a kind of shorthaired chinchilla around the sides. Hunter's ears are larger than mine, so I wore small devices to make mine poke out a little more. And there's a unique body language that Hunter has, and I could feel myself clicking into it once we started." Benecio Del Toro is also not to be outdone, as he has proven from his past performances, and turns in an equally impressive role as Dr. Gonzo. Anyone who has seen him before will be well surprised to note the 40 pounds he has gained to play Dr. Gonzo, who, as created by Thompson, is both an intimidating and overweight figure. Realizing this aspect of the character should be dealt with properly, Del Toro admits, "Every time I was bored I ate." It's incredible to see the transformation he's brought about. Passing through the city of lights are star-studded cameos performed by Gary Busey, Cameron Diaz, Mark Harmon, Katherine Helmond, Penn Jillette, Christina Ricci, Harry Dean Stanton, Lyle Lovett, Flea (of the Red Hot Chili Peppers), Ellen Barkin, and (are you ready?) Hunter S. Thompson (time warp time). The last scene in the movie suddenly takes a curve in tone and shows the hard edge getting the upper hand as the Waitress of the grimy North Star Cafe (Ellen Barkin) caters to her two manic patrons. The humor suddenly becomes subservient (similar to the effects during the short and sparsely scattered earlier newsreels and TV flashes earlier along the way) to the start of a new raw post-70's reality, a time and space when the Dream is dying. The Waitress gets hit sharply by this stark confrontation instead of the threatening meringue pie which never flies in her direction. The guys leave the cafe and head on down the road to the future that lies ahead. Director Gilliam wrote the script with Tony Grisoni, Tod Davies, and Alex Cox. and his creative team includes producers Laila Nabulsi (Nabulsi spent 15 years without giving up the attempt to get the book onto the screen, for which we thank you and love you, Laila), Patrick Cassavetti, and Steve Nemeth, DP Nicola Pecorini, production designer Alex McDowell, costume designer Julie Weiss, and editor Lesly Walker. And who deserves special compliments? As usual in a film made by Gilliam, the answer is everybody. What a piece of work. A WHAT DID I TAKE BEFORE I WALKED INTO THIS MOVIE?